Lost history of the Delaware Water Gap area comes to light along a short drive along the Delaware River north of Portland, PA. A few stops along the way to get out and walk a bit reveal some of the area's old resort sites, all now gone. Of the lost resorts, the largest and most lavish were on the Pennsylvania side of the river. Rock shelter at Lake Lenape. Follow signs on New Jersey's Route 46 north or I-80 west for Portland, PA. Cross the Portland-Columbia toll bridge over the Delaware River, then turn right onto the exit ramp immediately past the tollbooths. At the bottom of the ramp turn left and take Route 611 north through the traffic light into the river town of Portland, PA. In 1874, Portland's riverfront street boasted two hotels, many houses, the Ice Cream Garden, a barber shop, tailor, and a cigar manufactory run by a man appropriately named Coffin. Between the street and the river was a railway station and small rail yard. Near the old railroad depot, walk out onto the pedestrian bridge built on the piers of the former Columbia-Portland covered bridge, once the longest covered bridge in the US, washed away during flooding in the summer of 1955. Looking upriver from the pedestrian you'll see another record holding bridge, the Lackawanna Cutoff bridge, once the world's longest poured concrete bridge. The long, straight stretch of Route 611 north of Portland was formally opened in 1930 and parallels the old DL&W tracks. Dubbed the "Million Dollar Highway" and the "Lackawanna Trail", the wide straightaway was uncommon in its time, and drivers could not resist the temptation to test the speed of their vehicles. The patrolling officer needed a fast car borrowed from a local merchant to issue speeding tickets. 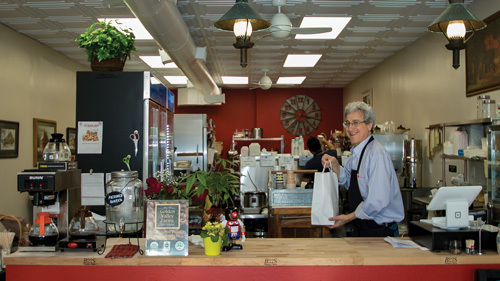 About a mile north of Portland's traffic light, Route 611 passes the Overlook Bar and Kelly's Ice Cream on the right, reminders of the numerous roadside stands and tourist stops that once bordered the river road up to the Borough of Delaware Water Gap four miles ahead. North of Portland, today's Route 611 parallels the older river road that passes through the village of Slateford to the right. The town derives its name, and its earliest existence, from the numerous former slate quarries nearby. Route 611 enters the Delaware Water Gap National Recreation Area near National Park Road, which comes down on the left. Following that road a short distance leads to parking for a few cross country skiing and hiking trails within the Recreation Area. North of Slateford, Route 611 approaches the Delaware Water Gap, formed by Mount Minsi on the Pennsylvania side and Mount Tammany on the New Jersey side. The refreshing natural beauty of this area has attracted tourists since the early 1800s, and even earlier. 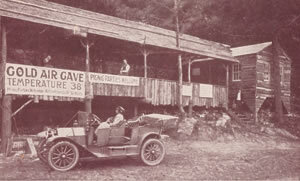 Roadside stands that once tempted tourists with hot dogs, souvenirs, fuel, meals and lodging, have long since disappeared, due mainly to the development of the Delaware Water Gap National Recreation Area. Less than two miles north of Portland, there is a spectacular view of the Water Gap at today's Arrow Island Overlook. At this spot, a roadside stand called the Bear Stop added caged bears and deer for the tourists' pleasure years ago. One of the area's oldest hostelries was located where Arrow Island Overlook's west parking lot is today. Known locally in the 1700s as "the old stone tavern", raftsmen who floated timber downriver to markets in Philadelphia stopped regularly. In later years the hostelry was known as the Mt. Minsi House, and then finally the Water Gap Manor. Minsi Mountain Park’s Cold Air Cave was a popular spot on a hot summer day. In the late 1890s the Mt. Minsi House and five smaller cottages were part of the long forgotten 200-acre Minsi Mountain Park. The cottages' names reflected their style: the octagonal Log Cabin, the Japanese Villa, the Star Cottage and the Adirondack Lodge. 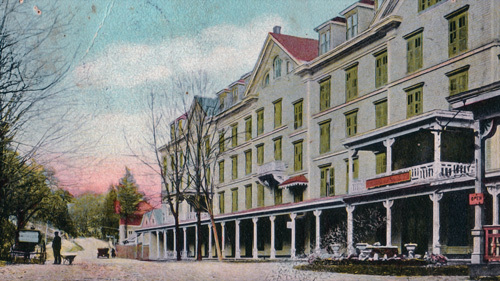 In 1903 the park's new hotel, the Casino, was built farther up the mountain, where an amusement room housed various parlor games, tabletop bowling alleys, shuffleboard, ping pong, billiards and pool tables. Outside, guests could hike the grounds' idyllic lanes and trails, engage in a game of croquet or lawn tennis, or just sit and enjoy the view. A moderate walk took them to the park's Cold Air Cave, or they could boat and fish in the river. 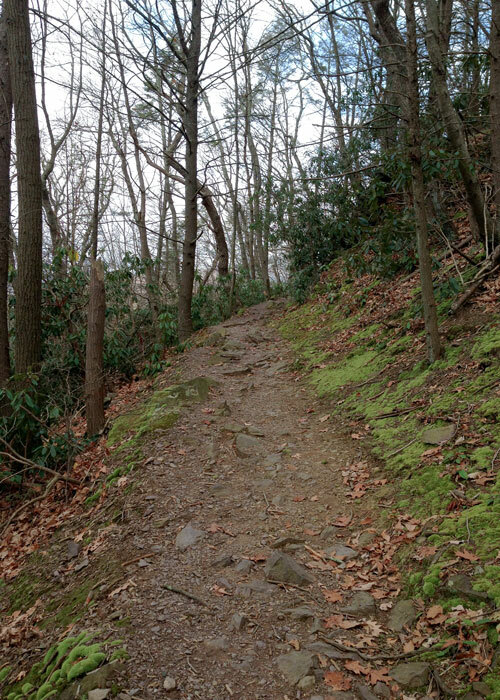 To find the scant remains of Minsi Mountain Park's lodgings, from the west parking lot of Arrow Island Overlook, follow the poorly marked Arrow Island Trail a few hundred feet up the mountain. Only sharp-eyed observers wandering along the old site's wooded trails will find the faint remains of the cottages. But hard to miss is the huge flat-topped mound of slate that once held the Casino, about 400 feet up the mountainside from the parking area. Not far from the Casino site, creative 1800s resort owners called an old slate quarry "the Grotto", even printing romantic postcards of it to entice their guests. The resort buildings took water from the "famous" Minsi Health Spring, the ruins of which are even farther up the mountain. 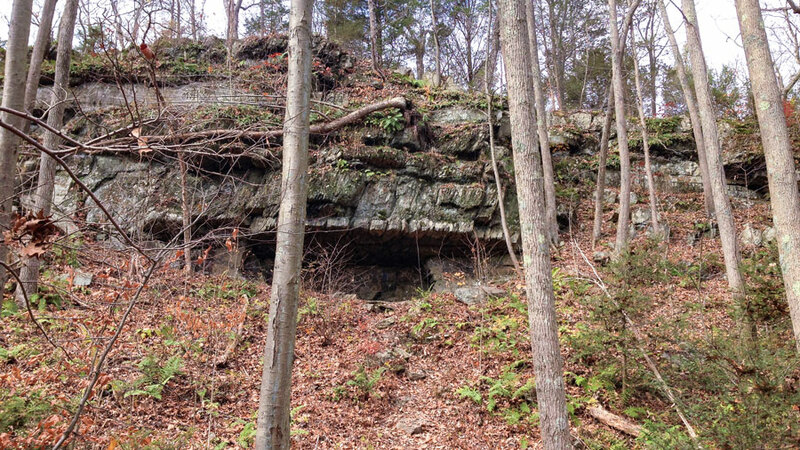 Less than a half mile north of the Arrow Island Overlook, Minsi Mountain Park's Cold Air Cave still exists a few dozen feet off of Route 611 at a wide gravel pull-off. Air cooled within the mountain to a chilly temperature in the 50s flows vigorously out of the cave. During periods of high humidity, a long, eerie "snake" of fog drifts from the cave's mouth, across Route 611, dropping down into the river below. Over the years various stands have been built in front of the cave, at least one of which used the cave's cool air to keep beverages cold. The cave has been recently closed to human activity for fear of spreading the White Nose Fungus, which now endangers bat populations along the East Coast. Near the cave a rugged trail, sometimes closed due to peregrine falcon activity, gives climbers access to the steep cliffs above. About two miles north of Portland the river bends sharply around Mt. Minsi, and Route 611 passes a second overlook at Point of Gap, also part of the former Minsi Mountain Park. Nearby, the Indian Head Lunch, so called for its view of the cliff across the river, offered traveler's fare and souvenirs at an open stand. Next door was Myrtle William's Gap Inn where 1920s tourists congregated for picnicking or camping. The Lackawanna railroad also had to bend sharply around Mt. Minsi's Point of Gap. At a spot just upriver from the parking area, in 1948, the engine of a passenger train derailed at the sharp curve, but the cars miraculously stayed on the tracks. In 1958, runaway cement hopper cars derailed at speeds over eighty mph and had to be removed from the river with huge cranes. And, in 1975, a freight train derailed after hitting flood-damaged trackage, one of its engines burned, and at least one of its cars remain in the river today. After enduring the rigors of negotiating past the Gorge at the Point of Gap, travelers were met with another roadside attraction called Child's Arbor, a food stand and rustic pavilions squeezed into the rocks at the edge of the narrow road. 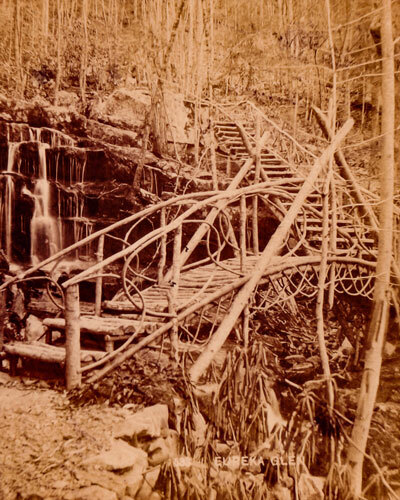 Using a series of rickety stairs and catwalks made with logs and saplings, tourists could climb upward through the rocky and treacherous Eureka Glen to be rewarded with spectacular views of Eureka Falls and the Moss Grotto for their efforts. Today only a few walls of the attraction remain at a small, dangerous pull off on which Art's Hot Dawg stand once stood. Above: Kittatinny House and Route 611 looking north in 1910. The Resort Point Lookout parking area is located today where the right half of the hotel is shown here. The hotel fountain ruins are visible there along Route 611. 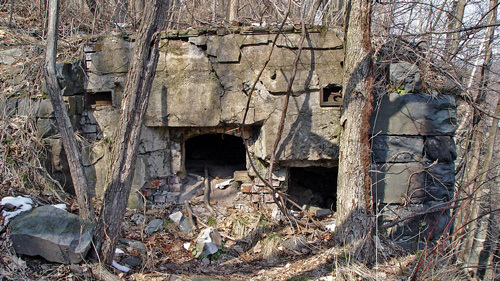 Below: Remains of the ovens at Kittatinny House are still visible near Resort Point Lookout. Five miles north of Portland, Route 611 reaches the third roadside overlook. Resort Point Lookout is located at the former site of two of the Water Gap's largest and most famous vintage resort sites, the Kittatinny House and the Water Gap House. The lookout has been constructed over a portion of the foundation of the Kittatinny House, in its day the largest resort in the Pocono area. The Water Gap House, once considered to be the most opulent of the Pocono resorts, was located a few hundred yards higher up the mountain. From the parking area, a short walk and careful exploration reveal the remains of the hotel's former kitchen, powerhouse, and additional ruins of other structures. Caldeno Brook, which still runs through the site, flowed through the kitchens of the hotel to cool its perishables and provide clear running water. The ring of rocks seen alongside Route 611 is the remains of one of the Kittatinny's fountains; the remains of a second fountain are found a short walk south of the parking area. Hotel guests usually arrived by train, and would then be transported by horse-drawn carriages to their resort of choice. 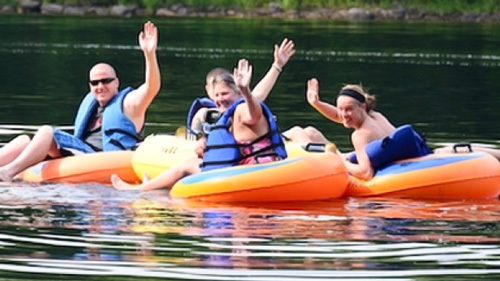 By hiking an extensive network of trails or by riding burros rented from nearby stables, resort vacationers could explore the hotel's Kittatinny Park, hundreds of acres of wild pristine beauty. The Park also offered a turn-of-the-century bowling alley and the rustic photo studio of Jesse Graves, a photographer whose photos of the area's scenic beauty are highly sought after by collectors today. Today's explorers can still hike most of Kittatinny Park's ancient trails, including a long section that has become a part of the Appalachian Trail. 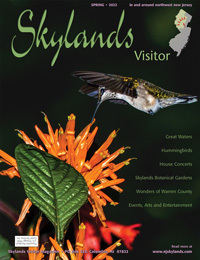 From Resort Point Lookout, walk across Route 611 and explore the old ruins of barns, other structures, and old roads that were once part of the Kittatinny. Hike up the rock stairs alongside Caldeno Creek's beautiful little falls. At the top of the stairs Kittatinny Park's True Ridge Path began its way to the top of Mt. Minsi a mile to the south. The first portion of this old resort trail is marked today by blue blazes as it wends its narrow way among the mountain laurels and rhododendrons whose spectacular blossoms bloom in June. Kittatinny Park’s True Ridge Path winds its way to the top of Mt. Minsi. Hikers will pass by the same overlooks visited by the hotel guests from the last century or two. A few hundred feet from the start of old True Ridge Path a small ledge once known as Lover's Retreat overlooks the parking lot below. Following the trail a few hundred yards farther yields a larger, higher ledge known as Valley View. Along the way many years ago "Charlie B" inscribed his name faintly on a rock in the trail, as did an ancient rock calligrapher welcoming hikers to the Valley View overlook. The trail's blazes will now be white as the Appalachian Trail begins to use the True Ridge Path's route to Mt. Minsi and beyond. Continuing onward a few hundred feet past Valley View, hikers pass the Council Rock overlook, and then 500 yards farther is Winona Cliff or Lover's Leap. One old story claims the Indian princess Winona threw herself over this cliff, distraught that her Dutch lover was ordered back to the Old Country. On a long gone trail hanging on the cliff below is a rock formation once called "the Dragon's Jaw". Seen from Promontory Rock, Mt. Tammany rises across the river in New Jersey. The True Ridge Path then climbs for about half a mile before encountering "the Promontory" overlook which offers a breathtaking view of the Delaware River nearly five hundred feet below as it passes through the Water Gap. A century ago a viewing gazebo was perched precariously here for use of the tourists. For a thousand yards past this point the trail becomes steep, rising 600 feet in elevation to another old outlook, "Prospect Rock" perched high atop Mt. Minsi near its summit, allowing the most spectacular view of the Water Gap. Return to Resort Point Lookout and then drive on Route 611 north for about .4 mile to Mountain Road on the left. Follow Mountain Road .1 mile to a gravel lane on the left which leads to a small gravel parking area for hikers. A small rooming house, Caldeno Cottage, was once located here where the parking area is today. 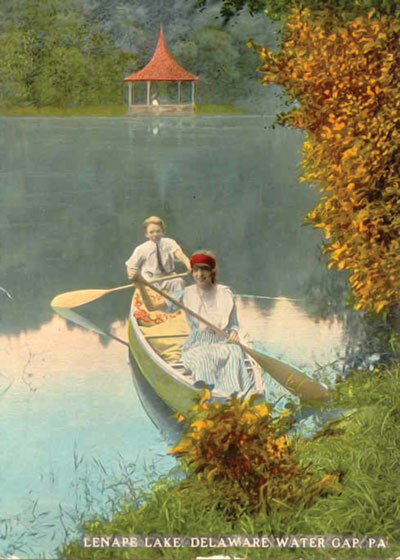 Fred Astaire and sister Estelle paddling on Lake Lenape during a turn-of-the-century, stay at Water Gap House. From the parking area walk eastward on the old "fire road" for a few hundred feet until it bends to the right around a small lake. Just before the bend look for the faint remains of an old lane bearing off slightly to the left up a small knoll once called Sunset Hill. This was the entrance driveway for the Water Gap House located a few hundred feet ahead. Exploration will show many clues as to the immense size of this sprawling hotel building. Among the many rich and famous guests to stay here were Teddy Roosevelt, Fred Astaire and his sister Estelle. Fire was a recurring tragedy for the old resorts. The Water Gap House burned in a spectacular fire in 1915, the same year in which Minsi Mountain Park's Casino was destroyed by a fire set by a disgruntled former employee. The Park's cottages were allegedly destroyed sometime afterward by an undocumented forest fire. The Mount Minsi House (aka Water Gap Manor) burned during renovations in 1929. And fire started in a room in which workers had been engaged earlier that day destroyed Kittatinny House in 1931. None of them were ever rebuilt. 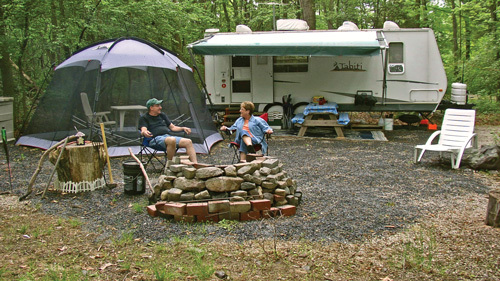 Return to the "fire road" and follow it to the left past Lake Lenape, a scenic reservoir which once served the needs of the neighboring hotels. The "fire road" was apparently the beginning of a "rim road" once intended to follow the perimeter of Monroe County, but which was never completed. Years ago automobiles could follow this road past Lake Lenape, then the Lake Lenape Rock Shelter from which the sun may be seen to rise out of the Water Gap on the Winter Solstice. By taking a right turn an old lane curves around to the Table Rock above which there is another great view of the Water Gap to the south. By staying on the "fire road" today's hikers will find another way to the top of Mt. Minsi, eventually meeting with the True Ridge Path and the Appalachian Trail close to the summit. Backtrack to Mountain Road and Route 611 North, turning left into the borough of Delaware Water Gap. Near the eastern edge of town, the Deer Head Inn has long been noted for fine musical entertainment. In the town are shops and eateries worth exploring. The Appalachian Trail wends its way through a section of the town, connecting Mt. Minsi and New Jersey's Blockade Mountain by crossing the I-80 bridge between them. To head into New Jersey at the traffic light in town turn right and follow the signs for I-80 East. For further reading on this area and its surroundings excellent sources are: River Towns of the Delaware Water Gap, Postcard History Series by Don and Marietta Dorfflinger; or The Borough of Delaware Water Gap, A Centennial Study by Frances R. Drake. The author wishes to thank Roberta Bach for sharing her extensive knowledge of the area which helped to uncover much of its lost history.